multiSAM is as flexible as the possibilities in modern biotechnology. 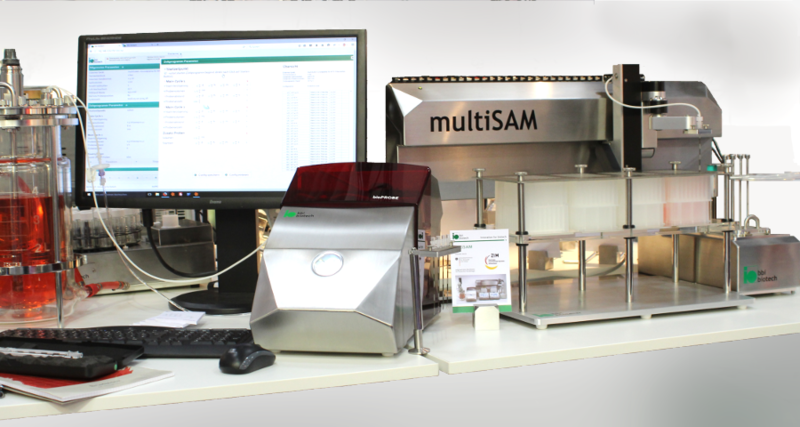 multiSAM can be used for sampling from one bioreactor with bioPROBE single and for parallel sampling with bioPROBE quad. With the help of Addons und Extension Packs multiSAM can be extended in its functionalities and customized to every application. Customized Extension Packs can be manufactured for every vial type with or withour septum. Contact us for more details! No distortion of the analysis! MTP Filtration Filtration with 96-Well-Filterplates of various manufacturers (Pall, GE, Millipore, ThermoFisher, Ahn-Bio, etc..). Suitable for the filtration of uncritical media in small volumes. Chromafil Cartridge Filtration 3ml Filtration with Chromafil 3ml filter cartridges of Macherey-Nagel. Suitable for the filtration of uncritical media. Chromafil Cartridge Filtration 6ml Filtration with Chromafil 3ml filter cartridges of Macherey-Nagel. Suitable for the filtration of uncritical media in larger volume. MediaKap Filtration Filtration with MediaKap-2 and MediaKap-5 hollow fiber filter cartridges by spectrumlabs. Suitable for the filtration of critical and high-concentrated media. Peltier Starter For the storage and cooling of samples in Eppendorf Thermostat C coolers. Suitable for vials with or without septum. Volumes from 2ml to 50 ml. Mixed configurations possible. Water Bath Standard For the storage and cooling of samples. With 4 exchangable sampling inlays. Possibility to be combined with Filtration Extension Packs. Quad for Bioprocess Bags For the combination of bioPROBE quad with multiSAM and an Extension Pack Bioprocess Bags. Quad for Bioprocess Bags XL For the combination of bioPROBE quad with multiSAM and an Extension Pack Bioprocess Bags XL. Safety Housing Additional safety housing. Automatic stop of all moving parts when opened. Sterile Housing UV Sterile safety housing for bioPROBE single + multiSAM or bioPROBE quad und multiSAM. UV sterilization and air circulation allow sampling in a 100% sterile environment. OPC Functionality Control bioPROBE and multiSAM via OPC UA protocol. Communication with external programs like matlab or SCADA systems. Customized Advanced sample preparation with external liquid handling platforms. Integration of dilution, mixing and other sample preparation modules. Customized solutions for your PAT process and your analyzers. Click to play a video of multiSAM with bioPROBE single equipped with the Extension Pack Peltier Starter.